IT COULDN’T happen today, could it? A third division (league one in the current money) team winning at Wembley. It didn’t happen much then, but for two out of three years in the late 60s, two teams from that level of the game created major shocks that have never been forgotten. Arsenal fans won’t need reminding of one of the most humiliating days in their history. 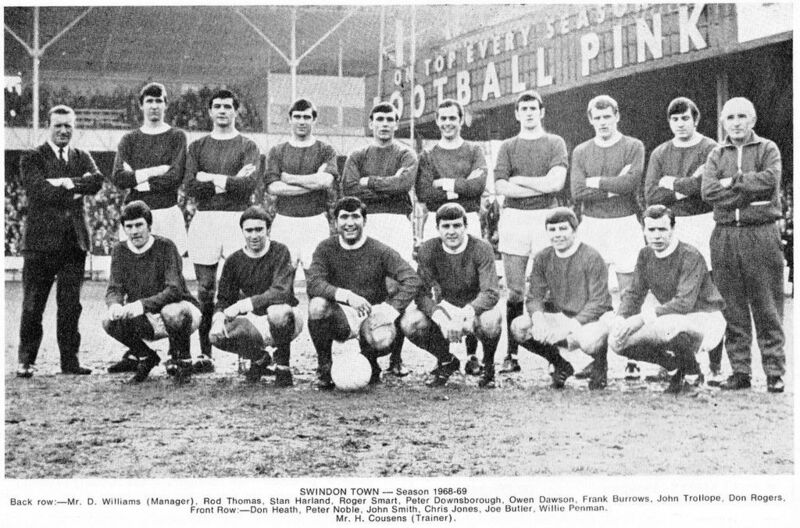 Aside from the FA Cup defeat at Walsall in 1932, getting trounced by Swindon Town on the equestrian paddock that was Wembley in 1969 ranks among the days when Arsenal’s faces were as red as their shirts. On the afternoon when Swindon won 3-1 in the Football League Cup final, Arsenal’s shirts were actually gold or yellow, depending on which paint chart you use, but their faces were very crimson! Swindon Town’s victory was earth-shattering and catapulted their star player, Don Rogers into the media. Rogers became one of the hottest properties outside the first division, but he remained loyal to Swindon for another three years. Swindon’s unexpected success has always been warmly remembered in the Wiltshire town. On a night when I was bound for Swindon’s second club, Swindon Supermarine, a cab driver met me at the railway station. I looked at his dashboard and there was a picture of the Swindon team that won at Wembley. There was Rogers and there was a very faded newspaper cutting from that final. “Ah..ha…a Swindon Town fan..Don Rogers and all that,” I quipped. He turned, grinned and looked me in the eye, expecting me to be an Arsenal fan given my accent. “One of us [cabbies] played in that game,” he replied. “Can you guess which one?”. “You’ve done well to name that many…but you forgot the taxi driver,” he responded. “Joe Butler…you’ve actually just missed him, he was on the rank 15 minutes ago.” So I lost the chance to meet a Wembley winner. It was a nice story, though and kept us talking until we arrived at Supermarine. Nobody would have predicted a Swindon win at the Empire Stadium. 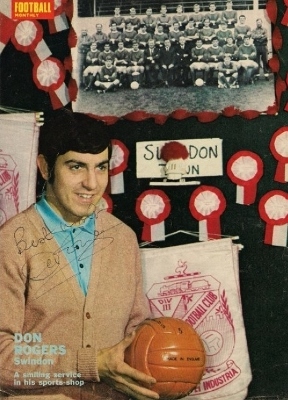 In 1967-68, Swindon had finished ninth in the third division and Rogers was the league’s leading scorer with 25 goals. They were only seven points off promotion, but this was in the “two points for a win” era. Danny Williams’ team was founded on fitness and stamina and relied on the virtuosity of Rogers for that special ingredient. Swindon trained exceptionally hard and a few years ago, Rogers recalled the tough regime installed by the Swindon boss. “It was 13 laps of the pitch at the County Ground on a Thursday. It used to keep me awake on a Wednesday night thinking about it!”. Rogers aside, Swindon were that typical third division mix of journeymen and loyal clubmen. John Trollope, for example, played for the club for 20-plus years, making 886 appearances. A no-nonsense left back, he was the type of player that rarely made headlines but was always dependable. In 1968-69, he broke his arm early in the season, only returning in January 1969. He hadn’t missed a game for seven years prior to the injury. Swindon started the season well and their first game was in the Football League Cup, a 2-1 win in the first round against Torquay United. In the league, they were unbeaten in their first six games and impressively, kept their goal intact in the process. By the end of September 1968, they had won through another two rounds in the League Cup, overcoming Bradford City and Blackburn Rovers. A seven-game winning streak from September 28 to November 2 took Swindon to the top of the table, a point ahead of Bournemouth, Watford and Barrow. Two defeats then sent them down to sixth place, but by this time, Rogers & Co. had beaten first Division Coventry (3-0) after a replay and promotion-chasing second division side Derby County in the last eight of the League Cup. Swindon found themselves up against Burnley in the semi-finals, while Arsenal were paired with Tottenham. On November 20, the first legs of the semi-finals took place. Arsenal beat Spurs 1-0 at Highbury, while Swindon pulled off another coup in winning 2-1 at Turf Moor with goals from Stan Harland and Peter Noble either side of half-time. In the return, however, Burnley reversed the scoreline and sent the tie to a third game. It was a see-saw affair, but Noble, in extra time gave Swindon victory by 3-2 and sent them to Wembley. It would have been easy for Swindon to be distracted by the glamour of a trip to the twin towers, but they kept in close contact with the top of the table. There were no obvious signs as they entered 1969 in second place, one point behind leaders Watford and a game in hand. The Football League Cup final was on March 15 and prior to Wembley, Swindon had been on an 11-game unbeaten run that ended on March 5 at Gillingham. A few days later, they lost 1-2 at Stockport. Williams’ men were top of the table, though, two points ahead of Watford, who had played two games less. It was clear, that the prospect of the cup final was having an impact on players unused to such attention. To their advantage, they were up against an Arsenal side that had been stricken with illness. A flu epidemic had broken out in North London, or at least in the vicinity of Arsenal stadium. The Gunners claimed that eight of their team had been hit by the bug and when they caught a glimpse of the pitch – which had recently hosted the Horse of the Year Show – they tried to get the game called off. Nobody was buying it, though and so it was an out-of-sorts Arsenal side that took the field. There was also another element to Arsenal’s apparent neurosis. The club had struggled to look its past in the eye. The legacy of “The Arsenal” of the 1930s had hung heavy on the Gunners and although they had won two league titles and the FA Cup in the post-war years, they had not won a single pot since 1953. They were desperate to bring some of the gilding back to Highbury. Despite Arsenal’s bill of health, nobody gave Swindon a hope, but they started well and in the 35th minute, had the audacity to go ahead. Joe Butler chipped the ball into the area and Ian Ure – never the most balletic of players – made a meal of trying to pass back to Bob Wilson. It ricocheted off Wilson’s foot, allowing Peter Noble to run wide and find Roger Smart who walked the ball into the net. It was a messy goal and only served to create more anxiety for Arsenal. For long periods, Arsenal dominated and into the second half, they were on top and building-up the pressure. Finally, in the 86th minute, they equalised. The imperious Peter Downsborough – a pigeon fancier in his spare time – made a rare mistake and came out to intercept the pugnacious Bobby Gould, the striker who was supposed to represent a brave new era for Arsenal when he was signed from Coventry City for a big fee, the ball spun into the air and Gould headed it past Downsborough and into the net. He promptly burst into tears! Surely, now, Arsenal would go on to win? Swindon had not read that script and in extra time, thanks to those weekly runs around the County Ground, their overcame the energy-sapping Wembley pitch. Don Rogers netted from close range following a corner just before the end of the first period, a crucial time to score. Rogers did it again right at the end of the game, bursting into the Arsenal half, rounding Wilson and sending him into the mud and tapping the ball home. “And that….is that,” were the immortal words of ITV commentator Brian Moore. Little Swindon Town of the third division 3 Arsenal…the mighty Arsenal of the first division…1. Peter Downsborough , Rod Thomas (Welsh international and later played for Derby), John Trollope, Joe Butler, Frank Burrows, Stan Harland, Don Heath, Roger Smart, John Smith, Peter Noble (an underated striker) and, of course, Don Rogers. And let’s not forget the solitary sub, Willie Penman. Nobody had much sympathy for Arsenal, either, despite the excuses that came in the aftermath. Arsenal players of the era have gone on record as saying that the humiliation of losing to a third division side acted as the catalyst for what would become the “double” winning side of 1970-71. What Swindon’s win demonstrated was that back in the 1960s, football was a more democratic game. Teams from the lower divisions could cause major upsets. In 1967, QPR, then of the third division, beat West Bromwich Albion in the League Cup final in dramatic style. The League Cup and FA Cup in 1968-69 provided some classic examples: in the League Cup, Crystal Palace (Div 2) beat Leeds (eventual champions) 2-1, Derby County (Div 2) beat Chelsea 3-1 and Manchester City (1968 champions) were knocked-out 1-0 by second division Blackpool. And in the FA Cup, Mansfield Town (Div 3) beat West Ham (Moore, Hurst and Peters et al) 3-0. The cognoscenti felt Swindon were, in fact, much better than a third division side, and at the end of the season, that opinion was endorsed by promotion to the second division. They finished runners-up to Watford on goal average. Most people expected Rogers to be on his way as a £100,000 player. Liverpool were courting him for a while, but to his credit, he stayed loyal to the club. Surely, there was the prospect of European football? Not so, unfortunately, as Swindon were not allowed to enter the Inter-Cities Fairs Cup because of their domestic status. But a few heads got together – doubtless one was Gigi Peronace, the Anglophile Italian football mover and shaker – and they created the Anglo-Italian League Cup, a two-legged final between the league cup winners of England and Italy. Swindon met AS Roma in August 1969, a team managed by the legendary Helenio Herrera and featuring one Fabio Capello in midfield. Swindon won 5-2 on aggregate, losing 1-2 in Rome and then winning 4-0 at the County Ground. A year later, they played in the more expansive Anglo-Italian Cup, whose format seemed to be devised with a slide rule. After beating Juventus home and away (4-0 and 1-0) and winning one and losing one with Napoli, Swindon topped the English clubs involved (Swindon, WBA, Sheff. Weds, Sunderland, Wolves and Middlesbrough) to reach the final against the top Italian club – Napoli. On May 28, 1970, Swindon raced into a 3-0 lead in Naples, but crowd trouble forced an abandonment after 79 minutes. Swindon were awarded the trophy. It didn’t deter Swindon from entering again in 1971, but they only just failed to reach the final. In 1972, Don Rogers left the club for Crystal Palace, earning his club £175,000. Some people suggested he left it a little too late, rather like Rodney Marsh, who lingered on at Queens Park Rangers longer than he perhaps should have. That’s all to Rogers’ credit, but also highlights how different life was for professional footballers in the 1970s. Rogers owned a sports shop in Swindon and did return to the club to wind-down his playing career a few years later, before retiring in 1977. He’s still a hero in Swindon, by all accounts. And rightly so.